Internet has become so important unit in our everyday routine, that we can’t imagine our lives without it. In accordance with statistics Facebook was the first social network to surpass 1 billion registered accounts and currently sits at 2.2 billion monthly active users. The leading social networks are usually available in multiple languages and allow users to connect with friends or people across geographical, political or economic borders. About 2 billion internet users are using social networks and these numbers are still expected to grow as mobile device usage and mobile social networks increasingly gain traction. The statistic shows a timeline with the worldwide number of monthly active Facebook users from 2008 to 2017. As of the fourth quarter of 2017, Facebook had 2.2 billion monthly active users. 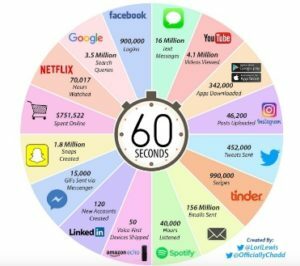 And there are 900.000 users’ logins on Facebook in one minute. www.statista.com writes “The most popular social networks usually show a high number of user accounts or strong user engagement. For example, market leader Facebook was the first social network to surpass 1 billion monthly active users, whereas recent newcomer Pinterest was the fastest independently launched site to reach 10 million unique monthly visitors. The majority of social networks with more than 100 million users originated in the United States, but European services like VK or Chinese social networks Qzone and Renren have also garnered mainstream appeal in their areas due to local context and content”. So we are introducing you what happens in one minute on the Internet. Next Next post: How Can You Differentiate Between Lab-Grown and Natural Diamonds?